It is early August and I have one satellite transmitter (or PTT) yet to deploy on a young eagle. Dave and Ann Lynch spent two solid weeks in late June/early July perfecting their craft of artful presentation of fish to the Decorah fledglings, yet the “kids” instead chose to food-beg loud and often and insist Mom or Dad bring them food at the nest. There was no evidence of any of the fledglings ever picking up a fish during that time. In previous years we’ve had multiple fledglings coming to the same spot – the mulch pile – for some easy meals, and usually within just a few days of watching and waiting for our talented trout tossers to appear. When visitor attendance diminished at the hatchery in late July, all three fledglings were still being spotted with regularity by several of our sharp-eyed eagle watchers. Hatchery biologist Brian Malaise and I kept in touch often and he and his crew again put fish out in the same spot. Lo and behold, the female, D27, began showing interest and eventually took advantage of these easy meals each morning. One of the males was believed to have also helped himself to the free offerings. We chose Monday, August 7 to attempt to capture whichever youngster decided to come to bait. 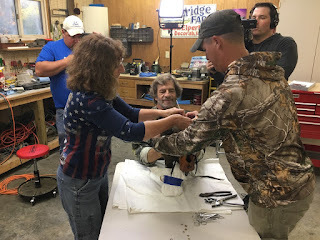 My wife Carole, Eagle Valley Technician Ryan Schmitz, and I arrived at Willard Holthaus’s shop by 5:15 AM and quickly set the padam noose trap baited with three nice hatchery trout. Weather was perfect: 58 degrees, mostly clear sky, light wind. All equipment and supplies were laid out in the shop in anticipation of a successful capture. Then we watched and waited. A few adult calls were heard from near the nest tree by 6:05. Then at 6:15 an immature eagle appeared from the west just above treetop height. I speculated it was large enough to be female D27. She landed in the maple tree briefly, then headed toward the mulch pile, looped over that area, perhaps checking out what food might be there, then circled back and landed on the mulch pile. We had placed a small trout atop the mulch pile, which she decided looked like a great appetizer. She rather daintily ate the fish and began eying the three trout just two feet away. She walked inside the padam, grabbed a fish or two in a foot, and tugged at them a few times as we all watched intently. When I was convinced she had a noose around a toe or foot, I gave the call to “GO, GO” and Ryan and Brian sprinted ahead to secure her. She was captured at 6:18, hooded, and taken to the shop where she was weighed (9.48 #) and had several measurements taken. The composite of those measurements revealed she is a small female. The entire process of getting measurements, banding, and fitting of the PTT was fluid and seamless. Within an hour of capture we were ready to release D27 and begin what is likely the final chapter of the Decorah eagle tracking story that began with our beloved D1 back in 2011. After placing her back on the mulch pile, she quickly oriented herself and flew north alongside the N1 Cottonwood tree to settle along Trout Creek. I cannot imagine a better crew than Carole and Ryan. John Howe, Brian, and friend Andrew Batt documented the entire process with photos and video. And a huge “Thank you!” to Willard for again making his shop available for all of this. What a great example of teamwork by all. I am so thankful for everyone’s input, time, and patience. We encourage all of you to join us in our prayers and positive believing that D27 lives a long, healthy life and the PTT functions properly for several years so we can continue to reveal the intricacies of eagle migration behavior. Stay tuned: thanks to Brett and crew, we will share D27's travels at http://www.raptorresource.org/eagle-map/. Dad brings in the two-for-one suckerfish special! It's been a bountiful season for The North's in the quantity of prey hauled home and caught on camera. A total of 449 meals delivered this year vs 163 meals in all of the last season. 32 meals were enjoyed just by Mr and Mrs North during nestorations and before the first egg was laid, 409 meals delivered to the nest from first egg laid to fledge, and another 8 "picnics in the pasture" post fledge dropped to the fledglings. That's quite a bounty! Also noteworthy is the true partnership in procuring the provisions by the parents to provide for their peeps. Last year it seemed that Mrs. North was more proficient than Mr. North in fishing, hunting, parceling out, or pilfering protein but this year the tally was almost 50/50 with Mrs. North bringing in 231 meals and Mr. North delivering 210 meals to the nest. The North's seem to practice 'field dressing' prey by breaking down larger animals and bringing in pieces or sections of their protein, but each delivery was counted as a meal. It's almost impossible to determine via long distance food drops the division of duty for the picnic meals, so those 8 meals are tallied as unidentified protein brought by an unidentified parent. The earlier egg lay this season (more in line with hatchery Decorah Eagles) allowed Mr. and Mrs. North to take advantage of the abundant fish runs of trout and suckers as well as filleted discards from the friendly landowners, more than doubling their haul to 246 fish this year vs 109 fish last year. Special applause to Mr. North on 4-12 for his 2 sucker fish delivery in a one-foot talon hold; and the new record on 5-13 of 9 fish in one day with 8 caught by Mr and 1 from Mrs. North. Other notable deliveries were 4 fawn heads, and other assorted deliveries of deer legs and quarters; Mrs. North's preference for 'cowghetti' (stringy cow placenta); and 2 turtles. What we learned this year is what excellent providers the parents are in purveying provisions for the pantree, and while not a lot is stockpiled like we see at the hatchery nest to the south, the remains are picked clean and dutifully taken to the dump when done. Both parents took an active role in feeding their offspring and there were several instances where Mr. North would have taken more of a share in feeding if not for Mrs. North's teakettle that she'd be in charge. This may have happened last year but the new microphone at the nest amplified the vocals that we have come to know as common by Mom Decorah, and it was interesting to add to our observations. Here's the full list of menu items in whole or part. Feathered: Birds (6), Chicken and parts (4), Coot (2), Duck (1), Gosling (2), Grouse or Pheasant (3), Turkey or Goose (1).